Sparkles with delicate crystals for extra elegance. Elegant, compact, and stylish. The Online Crystal inspiration Ballpoint Pen is made from satin aluminium in a gorgeous rose gold colour. Beautifully embellished with 30 studded Swarovski crystals for an extra special finish. It is a twist action ballpoint, fitted with a black refill and presented in a 'deco' presentation box. A perfect accompaniment to our handmade personalised journals. Made in Germany, Online has been a premier pen company since 1991. ONLINE develops high-quality products characterized by innovation, functionality and an eye for design and they are well known as “the colourful ones“. Made in Germany. Online has been one of the premier pen companies since 1991. 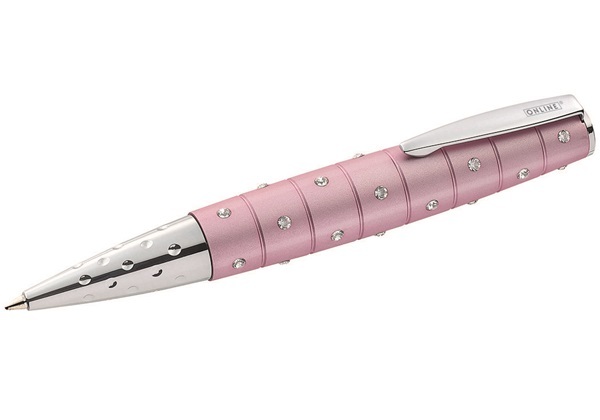 The Online Crystal Inspiration Ballpoint Pen is decorated with 30 studded pieces of Swarovski crystal. Aluminum base and mounting sleeve coloured in elegant rose gold.